1957 Kurtis Kraft 500G Indy roadster. Photos courtesy Worldwide Auctioneers unless otherwise noted. By the mid-1950s, Smokey Yunick’s skill as a mechanic and crew chief was well-established in NASCAR competition. 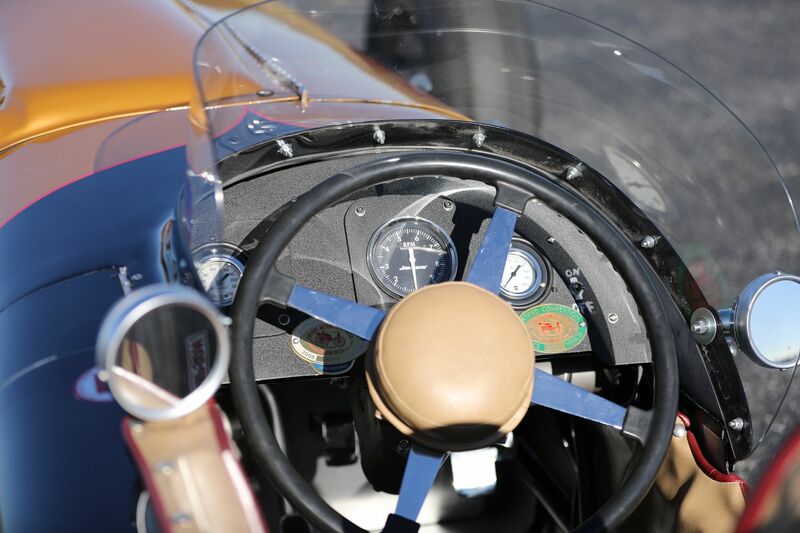 Tired of bumping heads with series founder Bill France, Sr., Yunick turned his attention to the Indy 500, drawn in part by the race’s less complicated rule book. 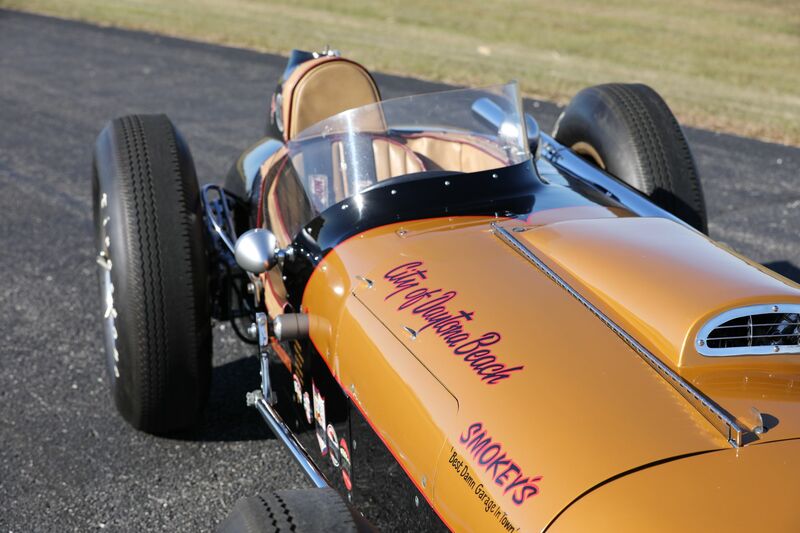 After three years of haunting garages along Gasoline Alley, Yunick bought and entered an Indy Car of his own for the 1958 race, and on January 17, 2018, this 1957 Kurtis Kraft 500G Indy roadster crosses the block at Worldwide Auctioneers’s Scottsdale sale. With just a modest budget to run at the Brickyard, Yunick couldn’t afford to buy a new Indy Car, or to build one of his own – yet. Instead, he settled on one driven in the 1957 race by Andy Linden, who started from 12th on the grid to finish the day in a respectable fifth place. The Kurtis Kraft chassis was popular, entered by 22 of 33 teams in the 1957 race, and so, too, was the Offenhauser engine, the choice of 31 starters in the 1957 field. As raced by Andy Linden in 1957. Photo courtesy IMS. There was good reason for selecting an Offy engine. Though the design for the 270-cu.in. four-cylinder most commonly run at Indy dated to 1937, it remained both competitive and durable, important factors in winning races. 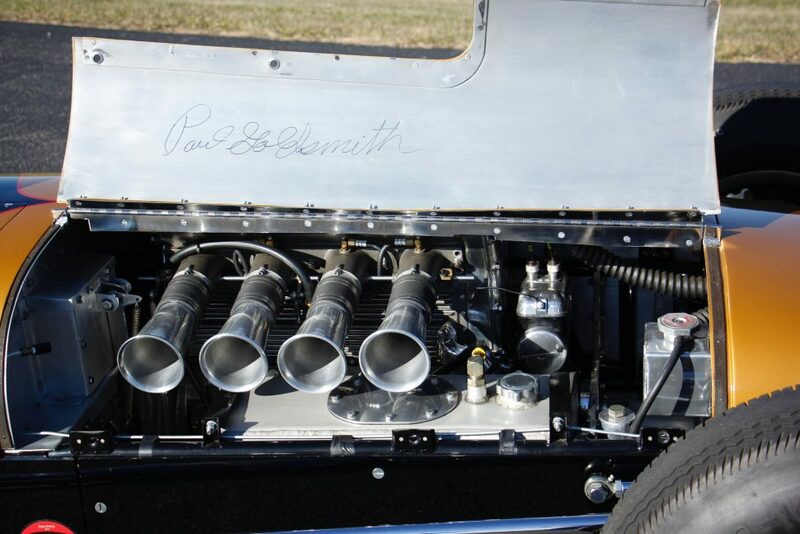 Thanks to its incorporation of the cylinder head into the block casting, compression ratios as high as 17:1 could be used, and in combination with dual overhead camshafts and four valves per cylinder, allowed the Offy engines to produce impressive horsepower. The 270-cu.in. Offy, in naturally aspirated form, typically produced around 325 horsepower, more if tuned by a knowledgeable mechanic. Paul Goldsmith at Indy in 1958. Photo courtesy IMS. Yunick knew his way around a Chevy V-8, but had only passing knowledge of the specialized Offy. That was still more experience than stock car driver Paul Goldsmith had behind the wheel of an Indy Car in early May 1958, but Yunick’s employee quickly proved as adept at driving an Offy-powered Kurtis as he was a piloting a NASCAR stocker on Daytona Beach. The fact that the freshman team was coached by Mauri Rose, a three-time Indy 500 winner and friend of Yunick’s, probably helped quite a bit. Despite Goldsmith’s inexperience, he qualified the gold and black race car 16th in the field of 33 cars, inside the sixth row. The beginning of the race didn’t go as planned, thanks to an error by front row drivers D*** Rathmann, Ed Elisian and Jimmy Recce, prompting the initial start to be waved off by the flagger. When the pack reformed in proper order on the second pace lap, the green flag was thrown before the pace car could emerge from the pits, and whether or not this had an effect on what came next remains a matter of debate. The pack made it through turns one and two without issue, but heading into turn three, Elisian spun, triggering a crash that would collect nearly half the field and claim the life of driver Pat O’Connor. Goldsmith was struck from behind by driver Jerry Unser, and the impact was violent enough to send Unser over the track’s outside wall and into the parking lot below. Remarkably, Unser – who would be killed in a qualifying crash at Indy the following year – landed upright and escaped with nothing more serious than a dislocated shoulder. Goldsmith was shaken but unhurt in the crash, which ended the team’s day before a single lap had been completed. 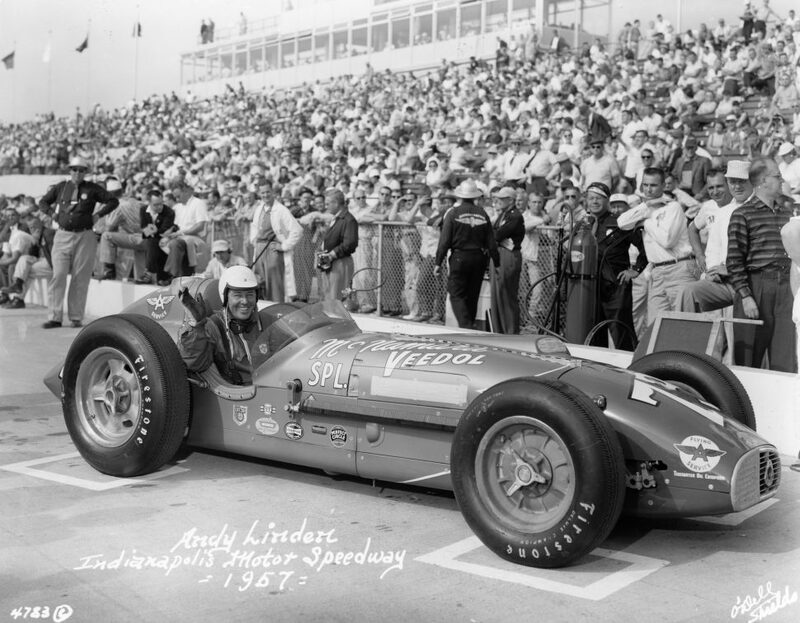 Though hardly the outcome that Yunick had hoped for – or even anticipated – the 1958 race was proof that he could run at Indy, and perhaps, with a bit of innovation, run competitively. 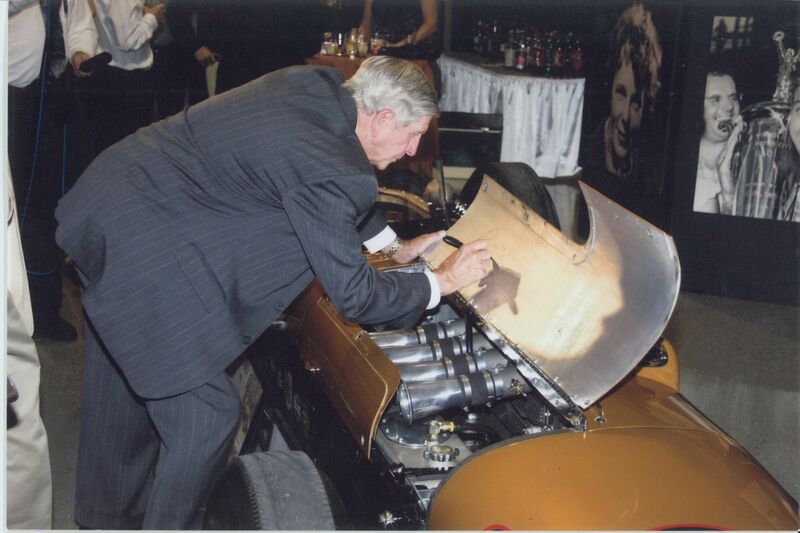 Paul Goldsmith signing the engine cover. 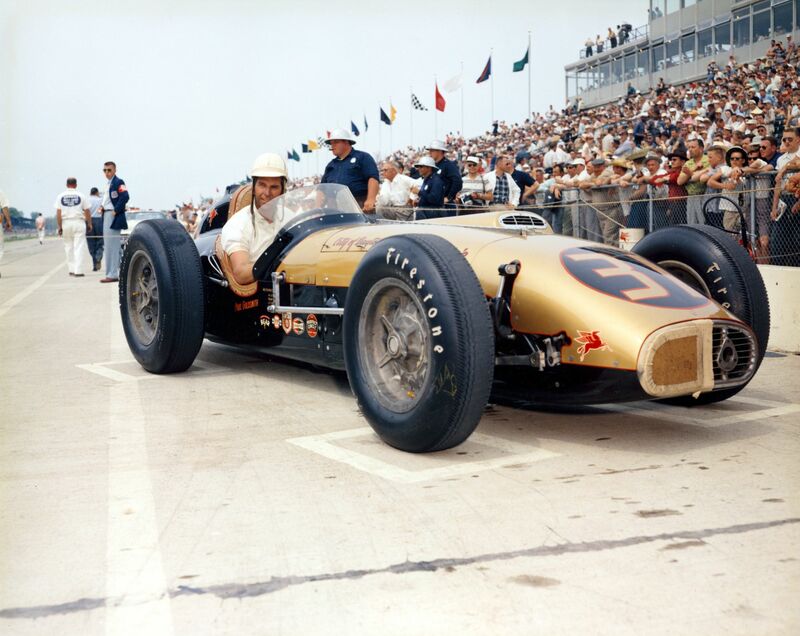 Yunick did return to Indy in 1959, with a car he called the “Reverse Torque Special,” built from a 1958 Kurtis Kraft chassis powered by an Offy engine. Paul Goldsmith was no longer available as a driver, but veteran Indy racer Duane Carter was, and put the Yunick car 12th on the grid. On race day, Carter finished seventh, an impressive result for the team’s second year, and while the ’57 Kurtis 500G run by the team in 1958 was trailered to Indy as a backup, it didn’t compete in the race. Yunick would get his win at the Brickyard in 1960, with driver Jim Rathman, though even this is surrounded in controversy as some credit Chickie Hirashima as the crew chief. In 1962 Yunick became the first to experiment with a wing on an Indy Car at the Brickyard, but found it created too much drag on the straights to be effective. In 1964 he developed the “capsule car,” which featured a driver’s pod mounted alongside – but not in – the car’s chassis. Neither the wing car nor the capsule car proved successful at Indy, but both demonstrated Yunick’s think-outside-the-box mentality regarding racing. Had he failed to qualify during his 1958 effort with Paul Goldsmith, it’s impossible to say if the allure of the Brickyard would have been as strong, making his 1957 Kurtis 500G a significant part of racing history. 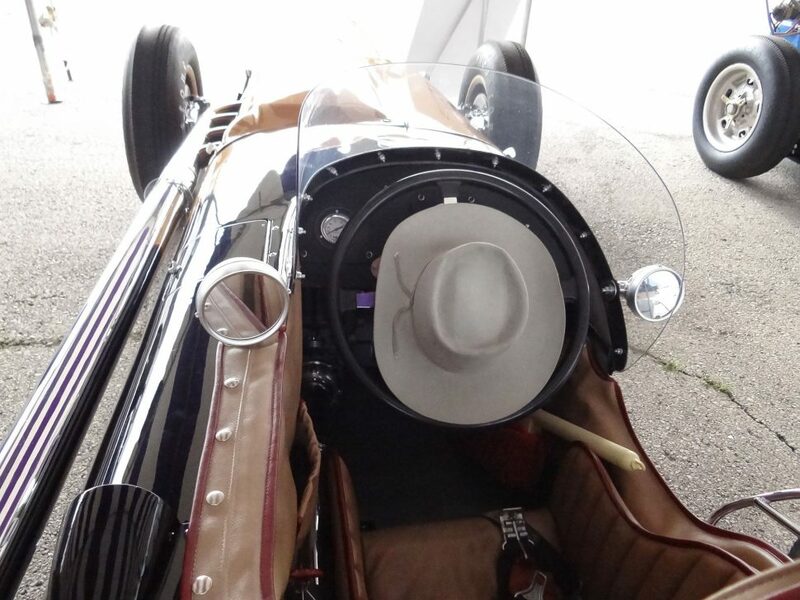 Restored by Classic Craft Motorsports and Moore Motorsports, the Kurtis bears AACA Senior First Place and Race Car certification and has been displayed at events including the Amelia Island Concours d’Elegance and the Goodwood Festival of Speed. Worldwide Auctioneers is predicting a selling price between $300,000 and $375,000 when the car crosses the stage in Arizona next month. The Worldwide Auctioneers sale begins at 5:00 p.m. on January 17, and takes place at 6460 East McDowell Road in Scottsdale. For additional information, visit Worldwide-Auctioneers.com.